Display the Settings | Properties | General menu. In the Floating Windows section, click the Enabled Windows checkbox to select the desired floating order entry style. 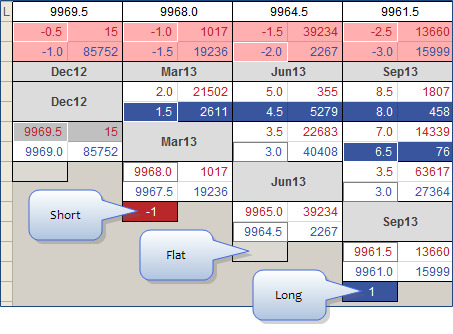 To trade the spread, simply click any of the four market data cells comprising the spread. This displays your selected floating order entry window. Adjust the price, set your desired quantity and submit the order. That is all that it takes to execute a spread trade. When using MD Trader as your floating order entry style, as each contact is selected, the floating MD Trader window populates with the contract information and is ready for you to place the order. Tip:You can click a price, quantity, or position cell to launch a floating order entry window. By default, a left-click initiates an aggressive action and a right-click initiates a passive action. A left-click on a price cell initiates an aggressive action (i.e., hit the bid or lift the offer) seeded with a quantity of zero or the default quantity if defined. When MD trader is your floating order entry window of choice, a left-click launches MD Trader seeded with a quantity of zero or the default order quantity if defined. A left-click on a position cell initiates an aggressive action intended to offset the current position and seeds the position in the quantity field. A left-click on a quantity cell initiates an aggressive action seeded with the quantity from the market. The Seed with market qty setting found on the global properties Order Entry tab controls this behavior and is enabled by default. Wen this property is enabled, a quantity of zero or the default order quantity is seeded into the floating order entry window. The Seed zero if market qty exceeds max qty property seeds a quantity of zero if the market quantity exceeds your maximum order quantity. This property is available when Seed with market qty is enabled. By default, a right-click on a quantity cell initiates a passive action (i.e., join the bid or join the offer) seeded with a quantity of zero or the default quantity. 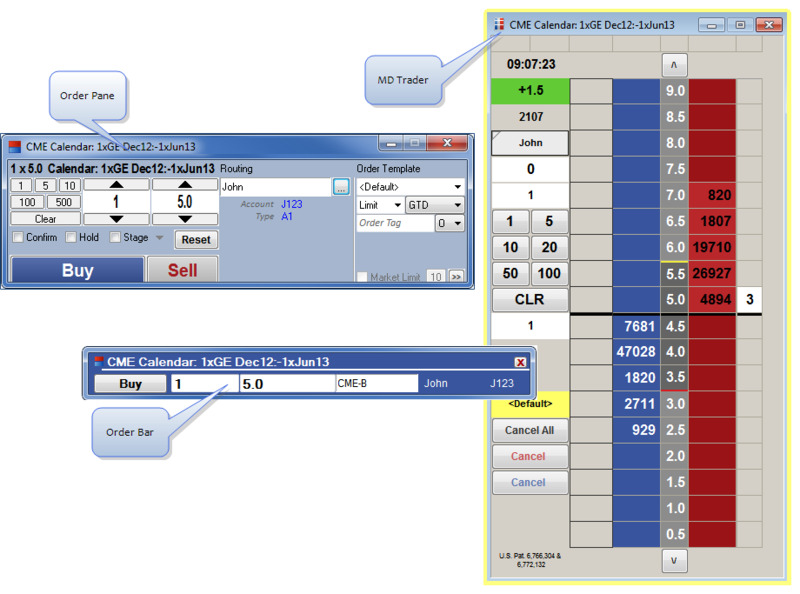 Right-clicks do not launch floating MD Trader windows; when MD Trader is the selected floating order entry window, a right-click on a price or quantity cell displays the context menu. Note: A right-click on non-price cells, non-quantity cells, a position cell, or the background outside of the grid cells displays the right-click context menu regardless of the selecting floating order entry window. Ctrl+Right-Click may be used to display the context menu if using the floating Order Pane or Order Bar. A property called Join on Left Click is available on the global properties Trading tab when the Order Pane or Order Bar are the floating order entry window of choice. A left-click on a quantity or price cell initiates a passive action. A right-click on a quantity or price cell initiates an aggressive action. If logged into a X_TRADER ASP environment, select the desired broker using the Broker drop-down. Click any of the price or quantity cells to populate the floating order entry window. 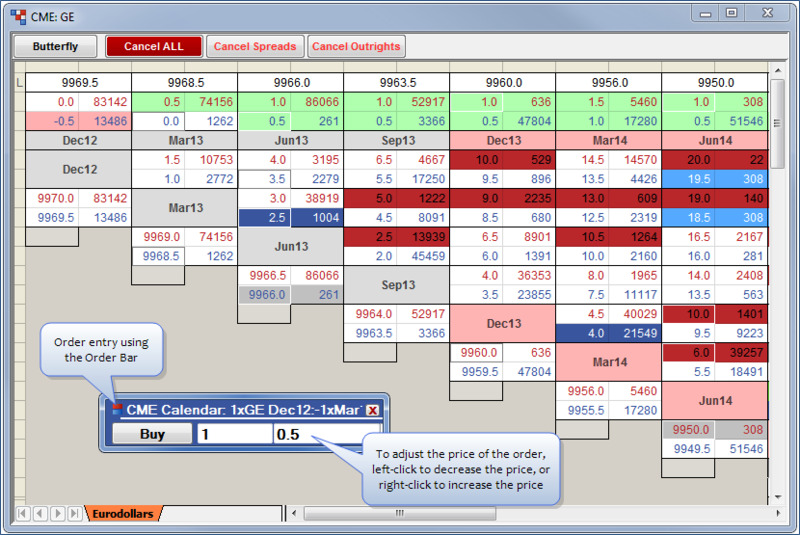 This displays your floating order entry window of choice (i.e., the Order Pane, MD Trader, or the Order Bar. Add the order details that you want to include and submit your order. Launch the Floating Depth Window according to the property set on the global properties Trading tab (i.e. Mouse hover or Middle click). Click the row at the price you want to trade. This seeds your floating order entry of choice with the contract and price you clicked. You may manage your working orders using the Floating Order Book. 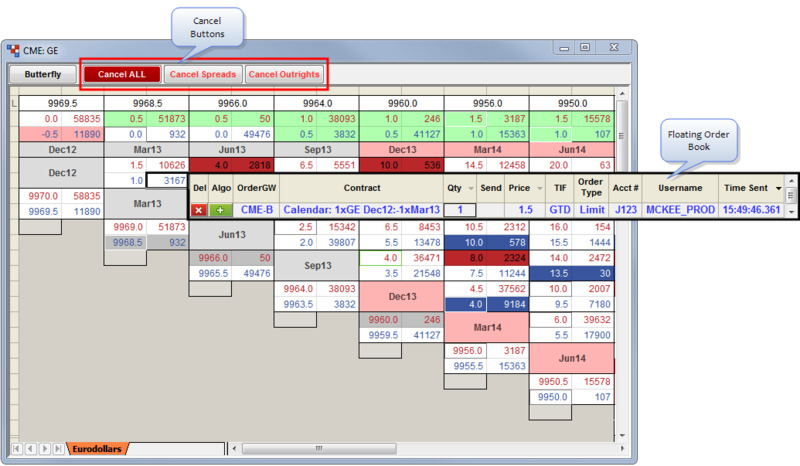 The Floating Order Book displays when you middle mouse click a quantity cell in the Spread Matrix. This works differently than the Market Window and MD Trader where the Floating Order Book displays when you middle mouse click your working orders. Note: You may select how you would like to launch the Floating Order Book from the global properties Trading tab. Your Floating Order Book method must be different from your Floating Depth Window launch method. By default, the Spread Matrix displays three cancel buttons that allow you to delete working orders for contracts displayed in the currently selected Spread Matrix tab. Note: Cancel Spreads does not cancel any outright orders you may have for the contracts displayed on the current. Note: Cancel Outrights does not cancel any spread orders you may have for the contracts displayed on the current tab. The cancel buttons do not cancel orders for different contracts on separate Spread Matrix tabs or orders hidden using the Show/Hide Series right-click context menu option. Tip: You can hide the cancel buttons by de-selecting the Cancel order buttons setting on the global properties Spread Matrix tab. Your position displays in each of the outrights, making it easy to see where you stand for all expirations of the product. Blue indicates that you are long, red indicates that you are short, and gray indicates that you are flat.